We are coming up on about six months of having our LVPPA Recreational Vehicle/Mobile Command Center (PPA 1), and the reviews have been great! Although there were many good jokes in the early stages, ranging from references to Christmas Vacation, Spaceballs and Stripes urban assault vehicle, we have settled in on a pretty good system for deploying and utilizing our new vehicle. In previous years, when shootings and critical incidents occurred, it was somewhat confusing for our members to know who we were and where we were on scene. Often our command center was a cluster of personal vehicles and our attorney operated out of the back seat of our cars. It wasn’t uncommon for us to be out in the elements for long periods of time, adding to the stress of an already stressful situation. Now, when our members are involved in a critical incident, most likely an OIS, there is no confusion about where your LVPPA representation can be found. 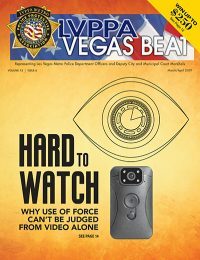 The PPA 1 will be staged right next to the scene or LVMPD command center, allowing our members the ability to come into a secure environment, decompress from the incident, counsel with your attorney and representatives, and await the formal processing by the members of the Department’s investigative arm. There are full bathroom facilities, drinks, snacks and protection from the elements. The vehicle can comfortably seat up to six to eight officers in the front. We modified the rear of the vehicle, converting it into an office with desk and chairs where you can have private consultation with your attorney on scene. There is a TV with satellite coverage to help pass the time during the lengthy process. There is a wash-up station on the exterior for quick cleanup, and a shower inside if a member was exposed to any sort of biohazard or substance. We have a sunshade and extra chairs in the event of a large-scale incident requiring a larger footprint of relief. There are phone-charging outlets and just about any other amenity you might need while staged and awaiting the processing of the scene. With the centralized location and high visibility of the RV, the Department knows exactly where to find you. This makes the coordination of FIT, CIRT, PEAP, criminalistics and command staff/chain of command much easier, and helps to streamline the process. Hopefully, this will take some pressure off our members as they navigate the sometimes very confusing process surrounding an OIS or critical incident. As a matter of early statistics, we have deployed over 10 times this year and have worked out most of the logistical bugs of our unit. If you have been part of one of these incidents, hopefully you had a good experience in a tough time. 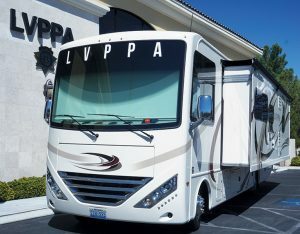 If you have not, rest assured, if you are involved in an incident and you see the LVPPA RV rolling down the street toward you, the cavalry has arrived! Hopefully, you have noted a significant change in the LVPPA under the new leadership of Steve Grammas and Scott Nicholas. They made a commitment in their campaign to give back to the membership in the form of member events, accessibility of the organization to the members, and moving the Association forward to bigger and better things. I believe they have kept their word thus far.